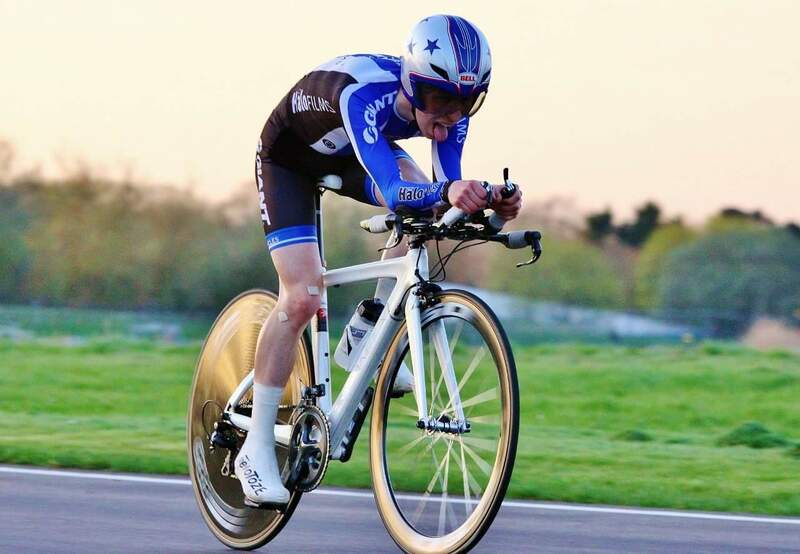 On Saturday, while the rest of the family had to get up early for another Omnium, I got to stay home, go back to bed for a bit and then do a time trial, not the perfect start to the weekend but much better than spending the day watching riders go round and round and round in circles! 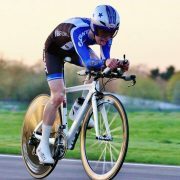 With the start only in Maiden Bradley and no one to get me there, I got to ride out there, going through the centre of Frome on the TT bike, disc wheel, deep front, aero helmet, Velotoze, any other TT kit, and a backpack on! I must’ve looked genius to anyone looking! After a pleasant but quick ride out, I signed on and then had to get the people at sign on to pin my number, as I haven’t yet mastered twisting round that much, close but not quite. Then a dump of kit, change of bottle, gel and I was ready to head down to the start, where I realised the number was as unaero as and elephant, so at the start I got Rob to help me re-pin a bit. Going over aptly named Deverill Hill I started to find legs, and did a quick climb, being able to hold speed over the top, with some support from High5 with sugar and caffeine! Over the other side I caught a rider with cars backed up, where on the tight lanes passing was quite hard, so I sat on the cars until I could get round, and with rest, sugar and caffeine I opened up again, the legs actually starting to feel semi decent now, perfect timing. the final part of the TT was a constant gradual rise up to Maiden Bradley, a lane I’ve ridden up and down multiple times over the winter, normally finding a block headwind. Today seemed to be different though, and I was able to shift quickly up there, coming into my own. Just in time for the finish! A strong finish meant I came 4th and won the junior category, in a time of 1:02:15, not as bad as I thought it might be after a few km. Thanks to Westbury Wheelers for organising the painful event, and thanks to the tubs for not puncturing through town, as that would’ve looked even better I’m sure! The normal thanks to sponsors for their support and help in my riding and development, it is massively appreciated. 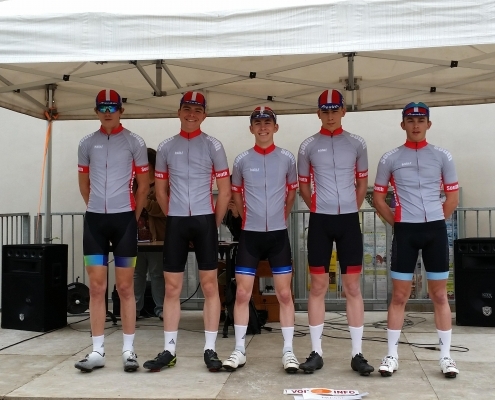 On Wednesday 2nd May I headed over to Bristol after school to begin the travelling for racing a French Junior National event on the north-west of the Alps, with the finish for the final stage previously used for the Criterium du Dauphine. 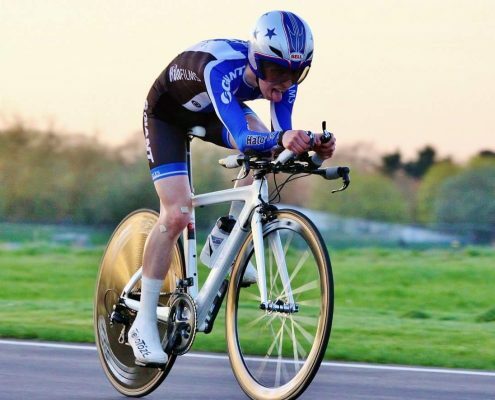 On Wednesday both me and Laura were racing the DB Max 10 mile TT at Castle Combe, which was the first time we’d done an official time trial at Combe, having done a few unofficial ones last year during Andy Cook’s Tuesday rides. But with decent conditions and a track clear of little kids, it had the potential to be a quick night and hopefully a few Pbs to be broken. We got there a little later due to bike issues and technicalities for Laura, so was in a bit of a rush to get signed on and into kit, luckily I’d realised this on the way over and had time to change into kit, especially putting on Velotoze, which was great entertainment in itself listening to Laura trying to get them on for the first time! After signing on I ended up riding round the circuit to warm up, as there was no way I was going to take the disc and deep section down a country lane to get from the car park on to the road, and with time against me, 30 minutes or so on the circuit warmed me up well, also giving me an opportunity to see what conditions were like, and do a couple of short efforts. From the set off I went out quite hard, and after looking down at the numbers told myself to reign it in a bit, but the legs didn’t seem to listen so I kept pushing, and just hoped I wouldn’t park up too much later on. was still surprised with how well I was going towards the mid point, with not slowing down and going even faster, doing the calculations in my head as I rode, anything to distract from the pain! Inside the last half I started to die, and the last couple of laps became very tough. Normally when I time trial I have enough to ramp it up, but this wasn’t an option. I was just trying to hold the same level, which was proving increasingly difficult. Going into the final lap I was properly on the edge, knowing I was on for a decent ride and time, although the legs were falling off. 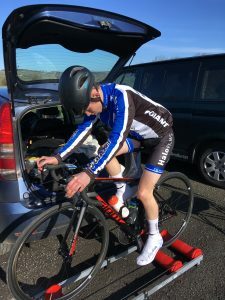 in the final part of the time trial where normally I can up it I was unable to push more power out, and my final sprint for the line was very laboured, nothing left. Splits later showing what I thought, the last two laps I’d parked up quite well, losing 5 seconds a lap over my quicker laps! Think i then did my slowest lap of Combe, taking around 9 mins, not even able to power a energy efficient light bulb most of the time! 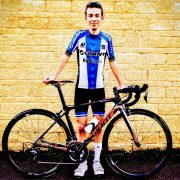 I ended up winning the junior category, and placing third overall, but more pleasing was doing a 40 second Pb and also a Pb for power significantly, proving that i just need to ride harder! 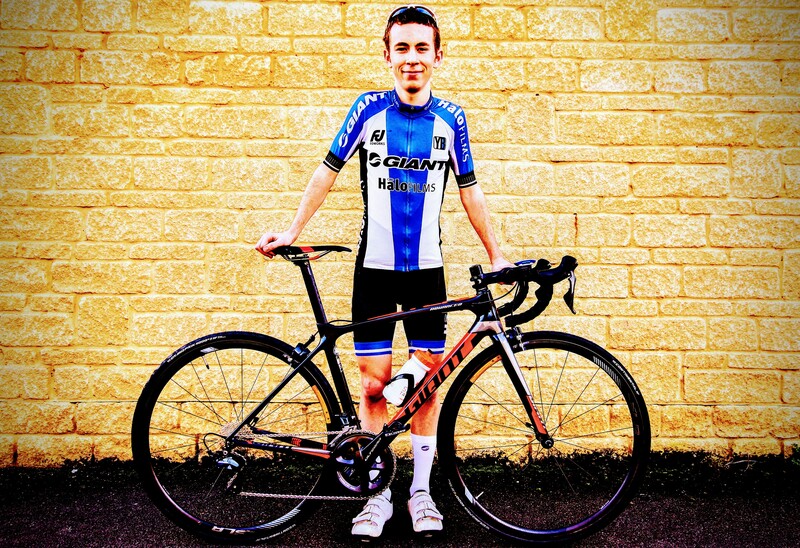 On the 7th and 8th of April I raced over on home roads at the Junior Tour of the Mendips, on roads and hills I’d been training on all winter with Tav and co, so i felt well prepared going into it, and also having carried out a reccy of the course in the week with team mate Jamie who was going to be racing the event for the first time. 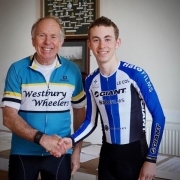 The race consisted of the standard format, a prologue round Chew Lake, a longer stage on the top of the Mendips, and then a final stage on the Sunday incorporating Burrington Combe, Blagdon and finishing up West Harptree. All set for a weekend that constantly changed race by race. I was one of the first off in the TT, a bonus in that I would have more recovery for the afternoon stage, a disadvantage as it meant getting there earlier, although compared to normal this was a short journey! With plenty of time to get ready I was able to take my time, and didn’t have to rush to make the start of the TT, ariving in plenty of time. 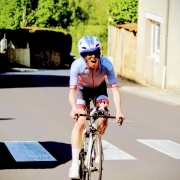 I didn’t go well in the TT, despite the reccy allowing me to ride the best effort I could, and despite getting it all out on the road I didn’t do a great time, losing 40 seconds over 4.5km, so not very good and down on GC, leaving it all to do on the road stages. I was disappointed with this result, I knew I’d lose time but didn’t think it would be that drastic, so was a bit down, but needed to pick up and go again for the afternoon race. 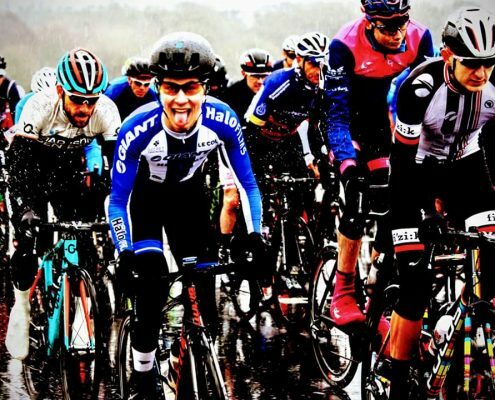 The afternoon race was ok, I missed the breakaway again, although being aggressive early on and looking to go with moves nothing was happening, it seems the one I didn’t chase stayed away, always learning! 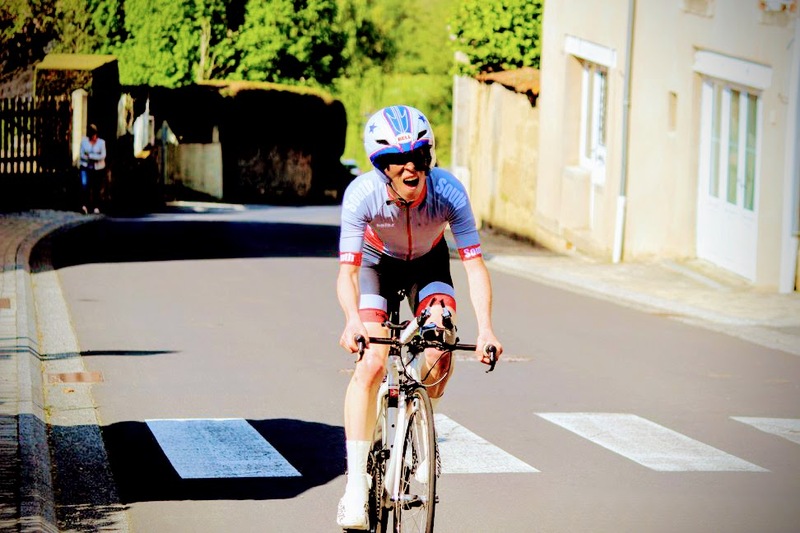 The race went up West Harptree and we raced up it this year, and I had some fun on it, completely in my zone, and loving every minute of it, seeing riders who put time into me in the tt going backwards. On the circuit I kept myself near the front, although drifted backwards at points, which was silly of me. Coming into the final lap the break had 2 minutes, and with a quick lap from the bunch that came back to 17 seconds on the line, and with a change in GC leader I ended up losing no time at all, so still 40 seconds back going into the final stage. The main aim of the stage was to stay upright and not lose more time, so mission accomplished. Day 2 rolled round, excuse the pun, and i was feeling ready to go. Warming up the legs felt good, and I knew what I needed to do, get in the break and then win, easy! In the lead up to Burrington I was too far back, and had to fight a bit on the lower ramps to move up the pack so if something went I was there. Part the way up I had some ‘encouragement’ from Tav and Stefan, which consisted of ‘Attack’ and ‘Go on’! Some great tactical advice! Later on was Dad shouting ‘come on’ which pushed me towards the front, coming over the climb in the top 10 with it all strung out behind, no KOM points but feeling good on the climbs. Over the top of Burrington attacks started to come, and no-one was interested in chasing them down, I was boxed in initially mid pack, but managed to get out when we hit yesterdays circuit, and hit out, to see what I could do. I smashed it down the climb and realised I had a gap that was worth pushing on. Coming out of a focus turn I was joined by Alex, a strong rider who had ridden a good tt the day before, so I realised this could succeed. 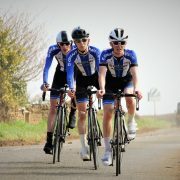 We pushed on and caught riders, making gains on the leading riders, which we managed to catch as a group of 8 on the lower slopes of Blagdon, where we had over 2.5 minutes on the bunch. This allowed a steady climb of BLagdon, although looking around everyone was struggling, and I still felt good. over the top we pushed on again, looking to maintain the gap. It was looking good, felt strong and guys were dropping. I was admittedly riding clever, pretending to eat and drink to save energy and not pull through, any gain I was going to take. Felt I could win the stage, and with that close to the overall. Then it all came tumbling down, literally! With around 10km to go, with the pack in arrears, a rider unintentionally moved across my front wheel, causing me to come down hard. Adrenaline kicked in and after quickly checking over the bike, I got back on and tried to get going. I couldn’t get a tow back to the break and with the group approaching I went to sit in, but the legs just couldn’t push, so I went out the back, and ended up coming in around 10 mins down, quite a contrast to where I thought I’d be! Over the line, collapse off the bike and then into the back on an ambulance to get patched up, not how I envisaged ending the race, but ah well, that’s just how it is sometimes. 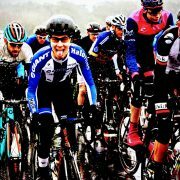 However it proved to me that I am strong enough to race at this level and spend the day in the breaks chasing the win. 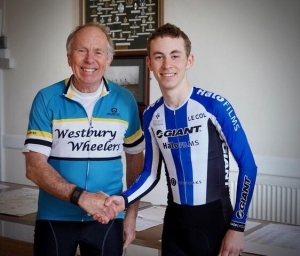 I would like to thank the ambulance crew for sorting me out, and all those who have helped me leading up to the Mendips and since, and to Stefan for making Burrington easier, “it will never get as hard as hanging onto my wheel up Burrington”! Its been a journey, just need to get to the line in one piece! Also my thanks to team and personal sponsors for helping this season to go and race with confidence in equipment, the bike and glasses were superb, and I could always see where I was going, which helps unless its down on tarmac!! And cheers to BCDS for putting on a local junior national event, makes a change! 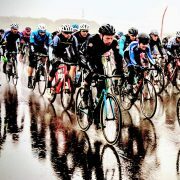 Well this was by far the worst weather I have ever had to race at Castle Combe, massive respect to all those who worked with Andy Cook cycling to put on the event, cold riders and volunteers at an epic days racing. This year I was racing in the E/1/2 race, a planned 90 minutes plus one lap for a bonus, with three primes throughout the race. Due to my sister racing I was at Combe from the early morning, so was seen as very keen by people in the sign on when I signed on over 3 hours ahead of the race! Due to the nature of the day we went out for lunch after Laura’s race, then back to the circuit in plenty of time. I got kit on ahead of time and went for a ride on the roads as an extended warm up, and did a couple of loops of a local road circuit, before returning to the circuit to see what the state of play was. The racing was delayed by about half an hour, so instead of standing around for more time I just went for a longer ride, getting in another road circuit! With that rideI got fairly wet, so then went back to the van to change into dry kit, have two massive numbers pinned on me, and then out to race. 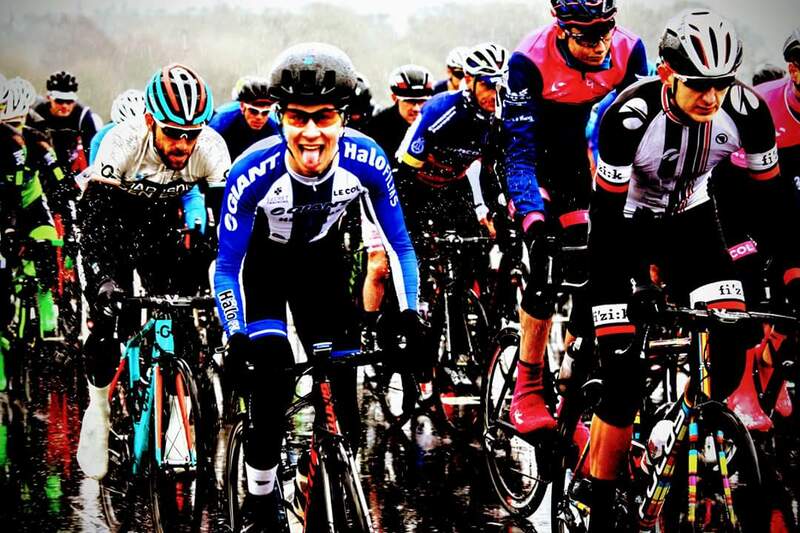 The race set off and pretty much stayed at 30mph for the duration, despite the horrendous conditions. With the weather the bunch riding was very good, with everyone realising that dangerous riding would just leave to crashes. Junior gearing made the race fun, from the start it was straight into the 52-14, and I didn’t change gear again! partially due to freezing in the rain, wind and spray and partially due to not having the need to, spinning the gear out on occasions. As the race went on i started to get colder and colder, and despite riding up and down the bunch to keep warm, i was starting to shiver on the bike. Having just come back from a cold I didn’t want to push it, and definitely didn’t fancy a bit of hypothermia, so after a few laps of shivering I pulled myself out of the race, and then tried to undress in the van… zips are impossible when you can feel your hands and are shaking like a leaf! Whilst the result wasn’t there, this was definitely a learning moment, where I realised that when conditions aren’t good I need to increase they layers and take extra precautions, such as a gilet under a skinsuit, or even racing in a warm winter training top! 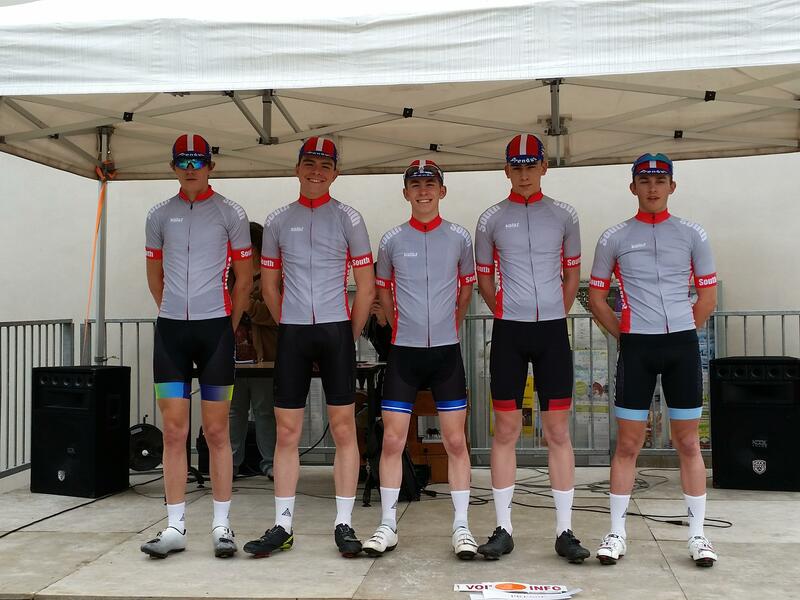 Just a bit of learning for the future, and some quick riding, all looking good for the next couple of weeks racing, next up a TTT on Sunday! 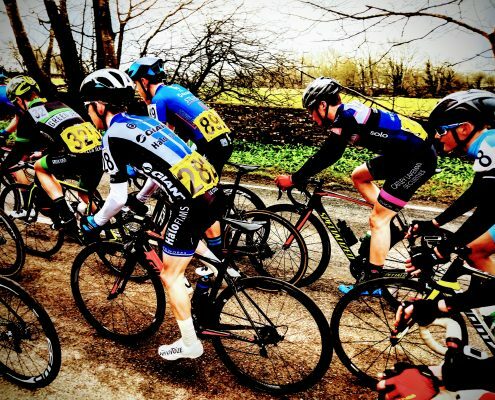 This was the first junior national series event of the season, and it was a very early start for me and Mum, made even earlier by the clocks going forward, so even less sleep. Waking up at what was 5am felt like the middle of the night! We arrived in plenty of time, even having enough time to make a few phone calls after someone might have forgotten a race license, and then forgot all about driving instructions! And a good time to make it on a road with no turning point for 5 miles, which was just great. Warmed up and felt ready to go on the new bike, felt fast and was looking forward to racing it. After a lengthy rider briefing with numerous mentions of no crashing, bit of an omen, and safe riding we were set off. 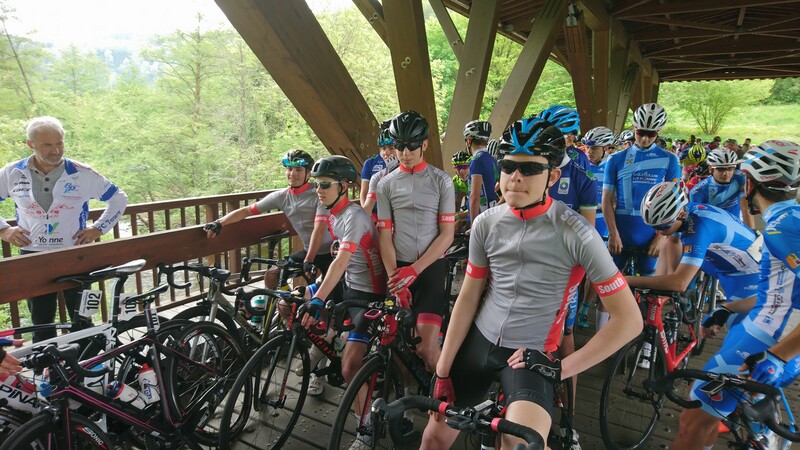 Neutral zone was carnage, lots of nervous riders fighting for 5-10 places at the front, as that is where the race is won, doesn’t matter about the next 70 miles. Despite the briefing we had 4 crashes in 4 miles, even one on the climb! 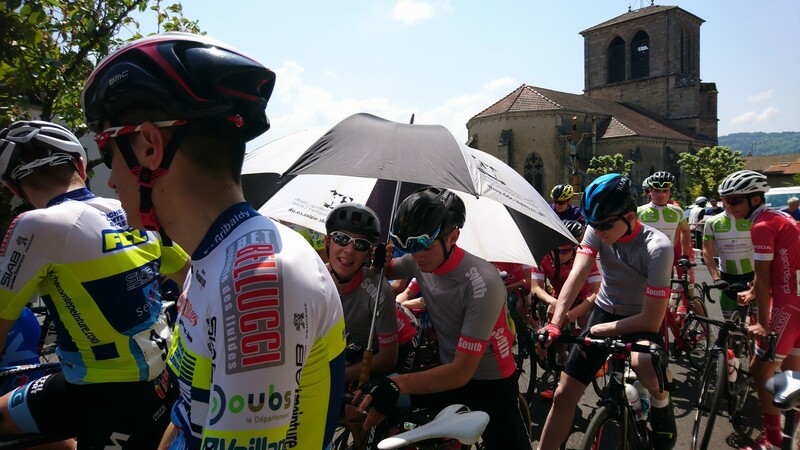 The race was then re-neutralised over the climb, and we were given a commissaire warning for riding, with those that crashed allowed to get back on to the pack. I was at the front for opening parts, and it took me a while to get used to pack again and the movements, but I had it sorted after a bit of riding. I missed the break, despite being sat at the front and seeing it go, but there was still 50+ miles of racing to go, and I just didn’t think it would last the distance. 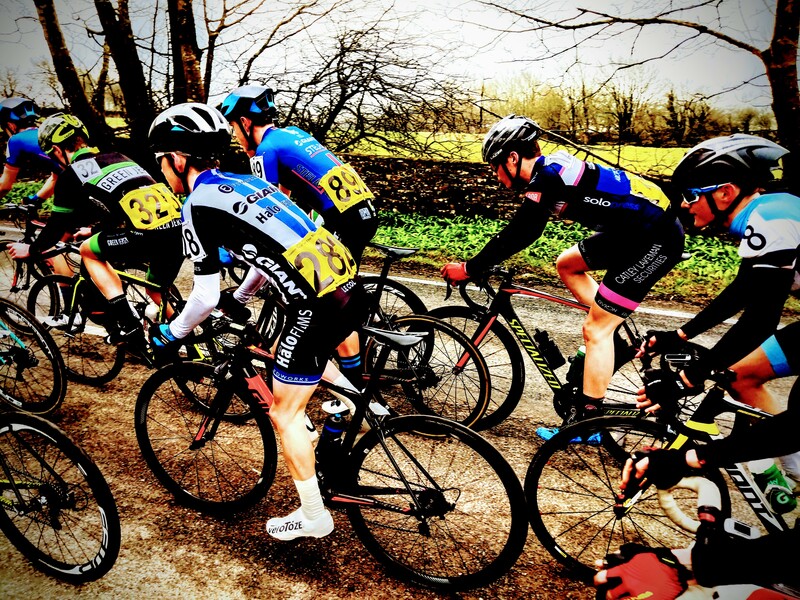 Of course the pack sat up due to big teams having riders up the road, and despite efforts from myself and others trying to attack to bring it back it just wasn’t happening. I then stayed near the front, but then got caught in a mass pack pile up! I wasn’t far back at all, with those riders at the back able to get off, walk through the crash and get back into the bunch! I then spent laps chasing but just losing time. I completed the race, although died with 1.5 laps to go. 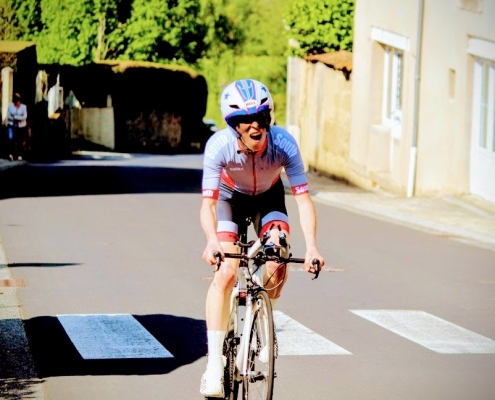 I was pleased with my effort in the race, but know I had good legs and it could have been massively different if i hadn’t thought too much about the break or had been in a different place in the pack! 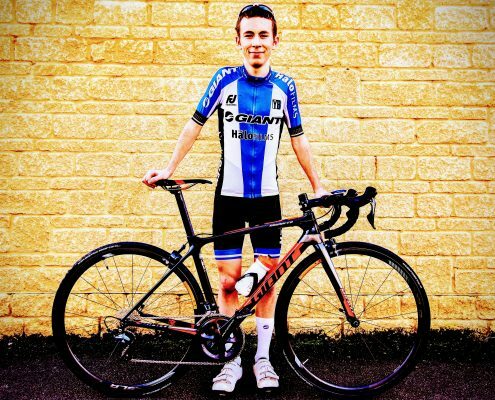 A good opener to the season despite the result, definitely have some good form to take into the next few weeks and sustain into Junior Tour of the Mendips on home roads in a fortnight. 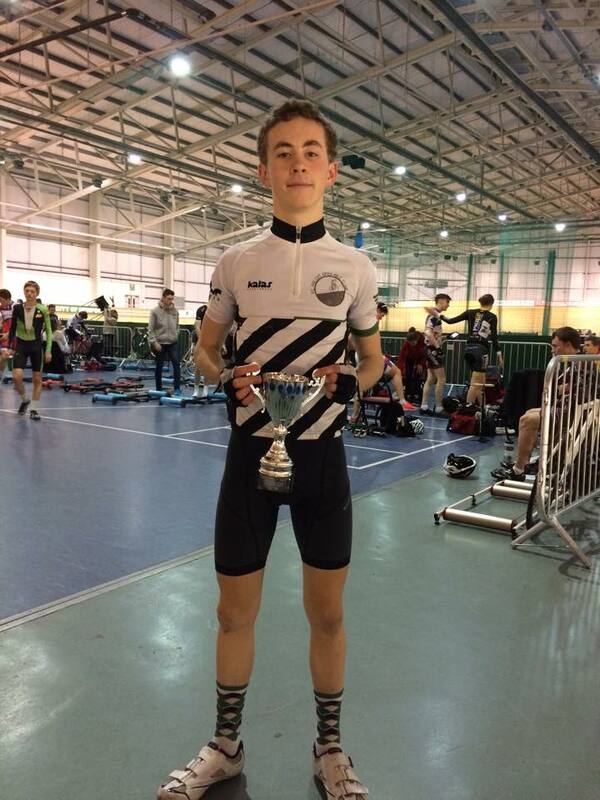 A very unexpected trophy this evening, I picked up the overall winner of the Newport Velodrome Winter Track League C.
I had been winning 3 events on most evenings that I attended, but I didn’t realise I had been often enough to have put together the points to take the win. I was surprised when my name was called out, as was Dad, but delighted all the same. I am now looking forward to moving up to the B league, and putting in to practice the things I have learnt over the last couple of months. [vc_row type=”in_container” scene_position=”center” text_color=”dark” text_align=”left” overlay_strength=”0.3″][vc_column column_padding=”no-extra-padding” column_padding_position=”all” background_color_opacity=”1″ background_hover_color_opacity=”1″ width=”1/1″][image_with_animation image_url=”40″ alignment=”” animation=”Fade In”][vc_column_text]On Tuesday 1st September I headed back to Newport Velodrome to do my track accreditation, so that over the winter I could race in the winter league at Newport. 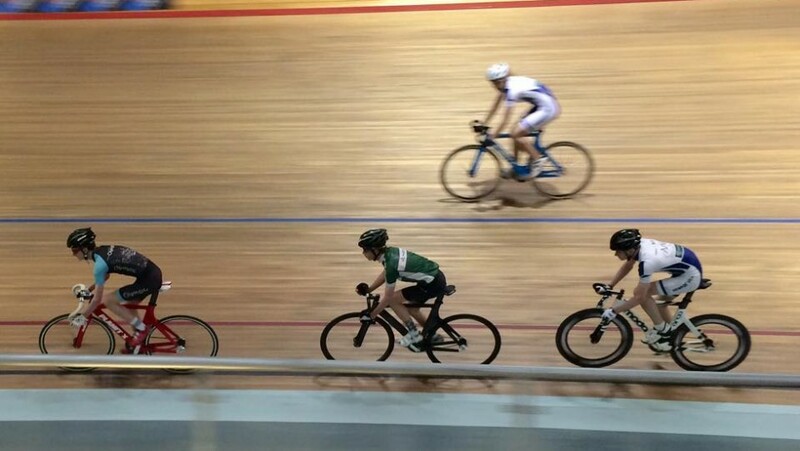 As Newport is an inside velodrome you have to pass a test to make sure that you are capable of racing safely, by doing drills and exercises safely. For the test you have to do everything properly and make signals obvious, a bit like a driving test, so the examiner knows what you are doing. You get 3 chances, so forget to look over your shoulder when changing 3 times and you fail. For the test we had to do a warm up. This consisted of riding around on the black line with changes every lap, and then moved on to riding on the stayers line (blue) with changes every half lap.This was very easy for me as I have been doing it at the track recently. We then had to space ourselves out by 2-3 bike lengths and the back rider would weave their way through going over and under until they got to the front. This was also a fairly straight forward and simple exercise, with the only problem being some riders not maintaining distance and sitting on the wheel in front – thus not leaving a gap to weave through. If this happened we were told to move on to the next one, I did this a couple of times when I was weaving through. The final thing to do was stacking riders and rotating in the stack. We were put in to groups of four, with one rider on the black line, one on the sprinters line (red), one between the sprinters and stayers lines and the last rider on the stayers line (blue). To change the back rider would slow down, the others would drop when it was clear and then the rider would come up to the top of the stack. The hardest thing about this exercise was that all of the front wheels had to be aligned all of the way around, apart from in the changes. The rider on the black set the speed and the others had to maintain the front wheel alignment. This meant going quicker at the start of the banking and then slower coming out of it, if you were higher up.